In this week’s issue of the New Yorker, I found a wonderful piece called “The Hunger Diaries,” by Mavis Gallant, the Canadian short story writer and novelist. The article is a collection of her journal entries written between March and June 1952, when she was living in Madrid. Gallant was a fledgling fiction writer in her late 20s, who quit her job as a journalist in order to travel through Europe and focus on her fiction. During the months covered in these diary entries, Gallant was awaiting payment of a short story that had been published in the New Yorker. She had no phone and obviously no email and was relying on her New York-based literary agent, Jacques Chambrun, to forward the checks. But Chambrun neglected to sent along her payments. Apparently, he later became well known for stealing his clients’ money. 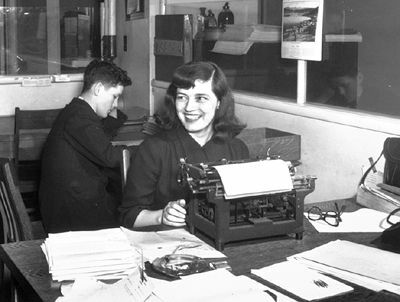 Gallant, not knowing where the money was or even that a second story had been published in the New Yorker, sold many of her personal items, including clothes, her typewriter and her grandmother’s wedding ring, in order to eat. Was filled with ice-cold despair because he [a friend of Gallant’s] had touched on the thing I only sometimes let myself suspect might be true: that I have gambled on something and have failed. Wrote letters to avoid the novel. It is all there, and, once I begin working, I am submerged, but the plunging in frightens me. The people in it aren’t as immediate as they were. I can’t see them on the street anymore. Told Frederick I no longer believe in the novel. He said, ‘Write it whether you believe in it or not.’ It is like watching a plant die. Something in me was lacking, or I would have kept it alive. Hungry and nervous, and went home with a blinding headache. But the day was splendid all the same, sunshine in solid blocks of light, a breeze, trees light green, deep-green grass, fountains throwing spray every way with the wind, all soaked and giddy with light. Despite her doubts, Gallant went on to become a great fiction writer. She wrote two novels: Green Water, Green Sky (1959) and A Fairly Good Time (1970); a play, What is to be Done? (1984); and numerous collections of stories, including The Other Paris (1953), My Heart is Broken (1964), The Pegnitz Junction (1973), The End of the World and Other Stories (1974), Across the Bridge (1976), From the Fifteenth District (1978), Home Truths: Selected Canadian Stories (1981), Overhead in a Balloon: Stories of Paris (1985), and In Transit (1988). Gallant’s ability to persevere in the face of doubt and hunger is an inspiration to us all. I guess writers throughout the ages have had doubt and blinding fear of failure. I read the same article in the New Yorker and was moved by Mavis Gallant’s commitment to her craft. I heard her interviewed on CBC radio a few months ago and was struck by her energy, joy and fascination with life. She’s 89 years old. I’ve only just started discovering her short stories. They’re incredible. I’m really enjoying your blog. Thanks for your thoughtful post.